Over the past few years the language industry has been actively exploring alternative pricing models, such as hourly or subscription-based models. Yet despite all the innovation, the good old word rate remains the metric overwhelmingly used by this multi-billion dollar industry. But how much does a word cost? Obtaining data from private sector clients is hard, as most buyers and vendors who operate large contracts are under non-disclosure agreements and are not keen to share potentially sensitive pricing information. The US Federal Government, however, provides a rich source of publicly available translation pricing information that can be reviewed. One key source is the General Services Administration (GSA), the US government’s independent, centralized procurement agency, which facilitates the provision of products, services, and facilities to US federal agencies. To enlist in its eLibrary, a searchable supplier database, companies are required to become certified. Once on the database, companies can access eBuy, the bidding site for government contracts. In its pursuit of transparency, the GSA publishes all of the proposals (schedules) submitted by its accredited language services providers. The proposals are not required to be submitted in a standardized format, but contain rich information on the locations, pricing structures and service information for each supplier company. As of December 2018, there were over 90 suppliers registered, ranging from giants such as Lionbridge, Transperfect and LanguageLine to boutique providers. Our limited survey aimed to analyze pricing, from English, for 11 of the most commonly translated languages: Arabic, Chinese (Simplified), French, German, Italian, Korean, Japanese, Polish, Portuguese, Russian and Spanish. From the 93 total suppliers registered under category 382 1 (translation services), a number did not qualify for inclusion in the survey, e.g. because some contracts had lapsed, some did not provide translation services, some did not provide translation services in the relevant languages and some did not have rate cards. In addition, a small number of companies provided hourly rates for translation services, whereas the survey focused on analyzing the pricing on a per word basis, since, as we said above, this metric remains the industry standard. 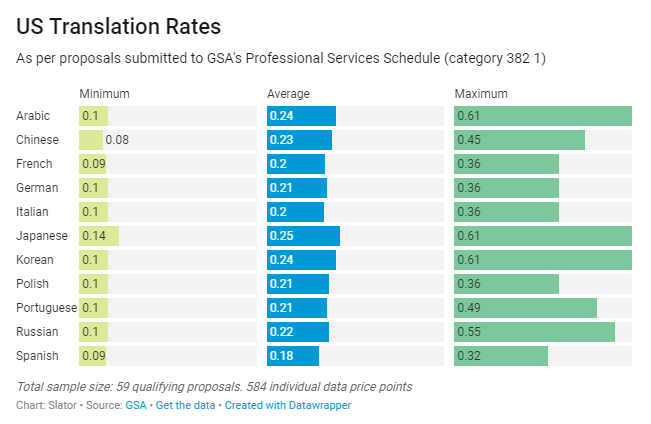 With a sample of 11 languages, an analysis of pricing data from 59 qualifying proposals submitted by language service providers resulted in over 584 individual data price points. Some suppliers provided a price range, e.g. for non-technical vs technical texts. For these companies, the average rate was taken to be the per word rate for the purposes of the survey. Across 11 target languages and across 59 suppliers, the average per word rate was USD 0.215, a marginal increase from the 2016 survey of the same nature. Analyzing the pricing per target language, Spanish emerged as the cheapest target language at USD 0.179 per word on average, with a price range of USD 0.09 minimum and USD 0.32 maximum. These rates were largely consistent those from the 2016 US survey, although both the minimum and maximum rates have actually risen by 0.01 and 0.02 USD respectively. The most expensive target language was Japanese, at an average per word rate of USD 0.251, followed narrowly by Korean, at USD 0.239 on average per word. Japanese, Korean and Arabic had an outlier maximum per word rate of USD 0.61, all proposed by the same supplier, Metropolitan Interpreters & Translators, Inc. This company also provided the maximum rates for French, German, Italian, Polish at USD 0.36 and for Spanish (USD 0.32), but not for Chinese, Portuguese or Russian. 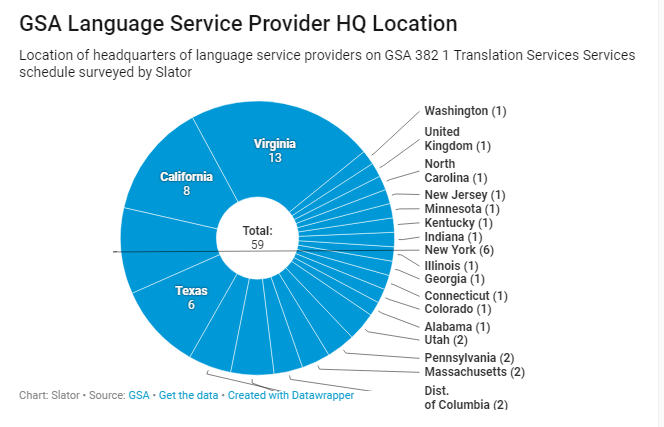 Our analysis also showed that US companies on the GSA schedule favor Virginia as a base (being close to the decision makers probably helps), followed by California, New York, and Texas. Across all languages included in the survey, the most expensive supplier based on average per word rate was Metropolitan Interpreters & Translators, Inc. (USD 0.437), way out ahead of the second most expensive provider, International Language Services, Inc., who came in at USD 0.352 per word. In third was ManpowerGroup Public Sector with USD 0.316 on average. Global Language Translation, Inc. was also within this range but only provided rates for three of the 11 languages, meaning the comparison is less relevant. On the more affordable end of the spectrum, under USD 0.15 per word on average across all languages, were Taikatranslations LLC (USD 0.104), Schreiber Translations Inc. (USD 0.128) and Dictyon LLC (USD 0.142). Worldwide Language Resources Inc. and In What Language LLC were also within this range, but provided eight and seven of the 11 languages respectively. There were six other suppliers who averaged between USD 0.15 and USD 0.16 per word for the 11 languages included in the survey. The giants sit between USD 0.007 and USD 0.042 per word above the average (USD 0.215): Lionbridge came in at USD 0.222 per word on average, TransPerfect at USD 0.248 per word, and Language Line at USD 0.257 per word. Aggregating proposals submitted to the US Federal Government does not necessarily reflect what is happening in the private sector, where, according to conversations with numerous industry participants, per word rates have been on a steady down trend for years. Furthermore, the above survey does not take into account potential price reductions achieved through volume discounts, translation memory discounts or machine translation post-editing offerings. Yet despite those shortcomings, using nearly 600 data points on current pricing submitted to one of the world’s largest buyers of language services does provide a useful yardstick to industry actors and buyers, if only to better size up competition when pitching to the government. Research Analyst at Slator. Localization enthusiast, linguist and inquisitor. London native.